It may be hard to admit, but�believe it or not�the original manufacturer probably knows more about your motorcycle than you do. Luckily, factory engineers are happy to share much of what they know about your bike in your owners manual. It will advise you on oil type, maintenance schedules, service procedures and more. Read it, study it, and memorize it. The most critical miles of your motorcycle's life are the first few hundred, then the next couple thousand. If you don't treat your bike right during these early stages, you could regret it later. Each bike comes with its own list of guidelines to follow for break-in. Some boil down to, "Ride it gently," while others can be complex programs that involve limits on maximum RPMs for a certain number of miles. Some bikes even call for one type of oil to be used for break-in, and another after that. Where do you find this information? Your manual. You hear it all the time: Scheduled oil changes�of the right oil�are the best way to make your engine last. Every motorcycle engine has lots of hard parts that whirl around at frenetic speeds. And the only thing that keeps them from grinding themselves into metal filings is a thin layer of quality oil. When oil breaks down, it can't do a quality job. So change it often, according to the manufacturer's recommended schedule�or even more often if you ride in dirty or dusty environments. What kind of oil should you use? That can be a heated question, particularly if you frequent many enthusiast websites, where you can encounter a dizzying array of recommendations about what viscosity, specification (car or motorcycle) or type (conventional or synthetic) of motor oil is best. Your best bet? Check your owners manual. 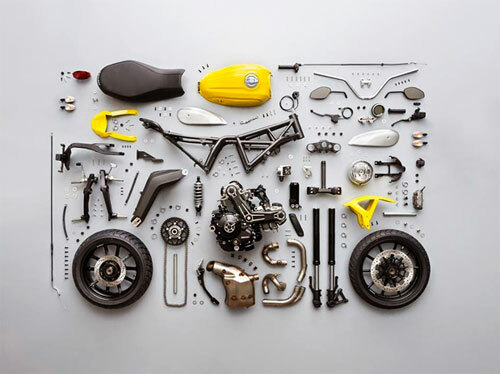 What goes in your motorcycle doesn't always come out. And a lot of what goes in passes through your air filter. That means if your air filter isn't clean, or, in some cases, properly oiled, you could be cutting off airflow to the cylinders and even allowing in foreign abrasives (dirt, dust or worse), where they can grind away at your valves, internal bearings and cylinders. So do yourself a favor. When it comes to air-filter maintenance, follow the recommended schedule as a minimum. And if you ride in particularly dusty or dirty environments, clean or replace the filter more often. Running the wrong air pressure in your motorcycle tires can negatively affect everything from fuel mileage to handling. It's not only wasteful, it's downright dangerous. By maintaining the correct air pressure in your tires (check it once a week with a reliable gauge), they will last longer. And considering they are your bike's sole connection to Mother Earth, the rest of your bike will thank you, too. The rule here is simple: Grease your bearings. New dirtbike buyers pick up this habit early, since many motocross bikes roll off the showroom floor already needing a healthy slathering of grease in areas such as the steering-head bearings and suspension linkages. But street riders need to keep their bikes lubricated, too. While the sealed bearings on modern streetbikes are relatively maintenance free, exposed areas such as suspension linkages need routine care. Even if you grease religiously, the time will come when you'll have to replace key bearings. So check them periodically. You can test your steering stem bearings by raising the front wheel off the ground with a stand. If you feel any notchiness when you turn the handlebars, or notice any play when you push on the fork back and forth, replace the bearings. Likewise, if you feel any play around the front or rear axle, the wheel bearings need to be replaced immediately. Another critical pivot point is the swingarm. It shouldn't move side-to-side. The scary thing about bearings is that when they start to go, they go fast�sometimes with catastrophic results. Never put off replacing a bad bearing. Also in the lubrication category, many bolts benefit from a bit of anti-seize coating when re-installed. Examples include the axles, swingarm bolt, linkage bolts and motor-mount bolts. Fresh oil and a clean air filter generally will keep your engine and transmission running right, but that's only two-thirds of your bike's mechanical make-up. The rest is the drivetrain�the chain, belt or shaft that transfers power from your transmission to your rear wheel. Depending on what type of final drivetrain you're running, you'll want to keep an eye on chain stretch, sprocket wear, belt cracking, or the condition and amount of oil in the shaft housing. Chain drive systems generally are the most maintenance-intensive, although if you run a sealed chain (O-ring or some variation) and don't run aluminum sprockets (which are light, but wear relatively fast), you'll probably find a periodic minor adjustment is all you need. A new battery starts dying the second you use it. However, its life can be a long one if you keep it and your charging system in good shape. The best thing to do to extend battery life is to keep it charged during downtime, preferably with a trickle charger. The other major issue with batteries is letting the electrolyte solution get too low. Low levels expose the internal plates, reducing capacity and increasing heat. If you can, eliminate this problem with a sealed, maintenance-free battery. Every one of us enjoys tricking out our motorcycles, adding this or that to change performance, up the style factor or otherwise make it our own. However, when considering aftermarket parts, evaluate whether they have at least the same workmanship standards of original equipment. If not, they may not last as long. Bottom line: Choose your bling wisely. If it works for airplane pilots, it can work for you. We mean, of course, going through a pre-ride checklist. That's the best way to find little problems before they become big ones. Bikes vary (yep, consult your manual), but, generally, you'll want to check: the level of both the motor and transmission oil; tire air pressures; fuel or brake-fluid leaks; bolt tightness; electrical switches and controls. If something is wrong, fix it. It may make you feel like a race hero if you power-shift your motorcycle without feathering the clutch or backing off on the throttle, but your transmission will grumble�literally. Likewise, braking easy, accelerating steadily and turning smoothly will help lots of parts last longer. You can be rough with your bike, but you'll need to be sure you're ready to do more maintenance. Just ride it! Too often, we get anxious to tinker with our pride and joy and start turning wrenches just to scratch that itch. Generally, you're better off just enjoying another long ride.